The Yellow-headed warbler (Teretistris fernandinae) is one of the most abundant and most frequently observed bird species in Cuba (Hamel and Kirkconnell). They are endemic to the island of Cuba but are specifically restricted to the western half of the island (Cory). The yellow headed warbler is in the Parulidae family of Aves which is commonly referred to as “the wood warblers” (Sangster) . The population of the Yellow-headed warbler is very stable and they are classified as a species of “least concern.” Although this species has a restricted range, they are not believed to be vulnerable to extinction primarily due to the large size of their population. Whenever it comes to flight, the yellow-headed warbler prefers the low and medium strata of a forest canopy and is seen very infrequently in the higher strata. They also forage at low to mid-levels mostly in low forest areas (Vázquez, Torrens, and Ramón). The yellow-headed warbler have a lifespan of around 4 years and are around 5.25 inches long (Cory). The evolutionary relationships of this genus is unclear and their placement in their present family (Parulidae) has been recently questioned because studies have indicated that it does not appear to be part of a definite single family clade like the other species in the Parulidae (Sangster). 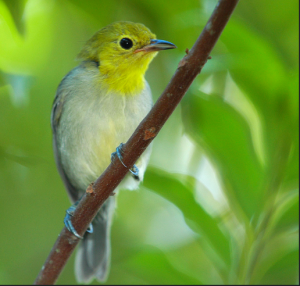 The Yellow-headed warbler is most commonly found in the Central and Western third areas of Cuba (Bond). It used to be on the eastern side of the island but has been replaced there by the Oriente Warbler (Cory). While the Yellow-headed warbler occurs mainly in scattered locations of the western regions, it also ranges from the east to Matanzas and south-western Las Villas provinces (Curson, Quinn, and Beadle). Yellow-headed warblers mostly inhabit forests and wooded vegetation at all elevations (Neotropical Birds Online). They can also be found in the forests of Zapata and more inland on the island of Cuba (Garrido and Kirkconnell). They can live at sea level to mid elevations away from other species. They like to live in areas that are primarily filled with shrubs with a lot of vegetation and vines and also a lot of forest undergrowth. They especially like to live in areas of forest undergrowth and scrubby thickets to avoid being seen by other animals (Buden and Olsen). the bird is plain gray (Neotropical Birds Online). More specifically, the yellow-headed warbler’s characteristics like eye-rings, chin, throat, and fore beck are all yellow. Their pileum and hind neck are gray like their back and their under parts are yellow becoming grayish on the under tail coverts (Curson, Quinn, and Beadle). They back, wings, and tail of the yellow-headed warbler are all a plain black color (Lowette and Birmingham). The bill of the species is also slightly decurved and they have a yellow hood which is tinged olive on the crown and nape of the neck (Banks, Cicero, Dunn, Kratter, Rasmussen, Remsem, Rising, and Stotz). Another aspect of T. fernandinae’s appearance is that the bird species has no wing bars (Raffaele, Wiley, Garrido, Keith). The size of the yellow-headed warbler is usually around 16 centimeters long when fully grown and they usually weigh between 6 to 18 grams depending on their age (Handbook of the Birds of the World Alive). another that their habitats are separated by less than 10 kilometers (Wildlife Rehabber). The common name of the T. fernandinae in Cuba and other Spanish speaking countries is the Reinita chillina (Snipeview). 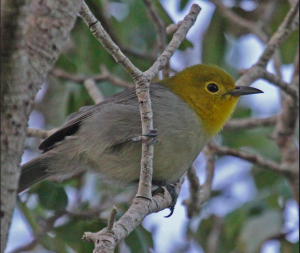 Though researchers have studied the life cycles of the yellow-headed warbler, the only conclusions that they have been able to make about their populations were quite vague. The population of the yellow-headed warbler is very large but its precise size and overall distribution is not known (Snipeview). Yellow-headed warblers breed in the months of March through July. It builds a cup shaped nest made with grasses, rootlets, pants and plant fibers. They almost always place their nests lower to the ground or low in bushes in order to hide them (Wiley). Their egg laying season is in April through May. They usually lay around 2 to 3 eggs which are sometimes pale-green colored. Oftenthe eggs are spotted with lilac and reddish brown at the larger end of the egg (Kirwan, Kirkconnell, and Flieg). The voice of a yellow-headed warbler is said to be very peculiar. It sounds like a shrill tsi-tsi-tsi repeated several times (Raffaele, Wiley, Garrido, and Keith). Others say that it’s voice is like a series of buzzy grating notes interspersed with some sweeter, more musical like notes. The voices of the yellow-headed warbler and the Oriente Warbler are said to be nearly identical so it is difficult to tell the two voices apart by ear alone. The yellow headed warbler feeds on a variety of things including insects and other invertebrates and sometimes even small lizards (Lovette). They also eat branches, foliage, bark and even soil (Lovette and Birmingham). Bond, James. Birds of the West Indies. Bronx, New York. Ishi Press International. 2015. Print. Curson, Jon, David Quinn and David Beadle. Helm Identification Guides: New World Warblers. Soho Square, London. Christopher Helm Publishers. 1994. Print. Garrido, Orlando, Arturo Kirkconnell. 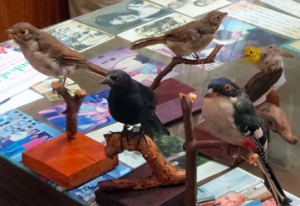 Field Guide to the Birds of Cuba. Ithaca, New York. Cornell University Press. 2000. Print. Kirwan, Guy, Arturo Kirkconnell, Mike Flieg. A Birdwatchers’ Guide to Cuba, Jamaica, Hispaniola, Puerto Rico and the Caymans. United Kingdom. BirdLife International. 210. Print. Raffaele, Herbert, James Wiley, Orlando Garrido, Allan Keith, Janis Raffaele. Birds of the West Indies. Princeton, New Jersey. Princeton University Press. 2003. Print. Yellow-headed Warbler. Snipeview.com. 2012. Web. 27 September 2015. Yellow-headed Warbler (Teretistris fernandinae). Handbook of the Birds of the World Alive. 2010. Web. 27 September 2015. Yellow-headed Warbler (Teretistris fernandinae). Neotropical Birds Online. 2010. Web. 27 September 2015. Yellow-headed Warbler. The Website of Everything. 2010. 27 September 2015. Yellow-headed Warbler. Wildlife Rehabber. 2015. Web. 27 September 2015. Banks, Richard, Carla Cicero, Jon L. Dunn, Andrew W. Kratter, Amela C. Rasmussen, J. V. Remsen, Jr., James D. Rising, And Douglas F. Stotz. “Fourty-Fourth Supplement to the American Ornithologists’ Union Check-List of North American Birds.” The Auk (2003): 923-931. BioOne. Web. Buden, D. W. and S. L. Olson. “The Avifauna Of The Cayerias Of Southern Cuba West Indies With The Ornithological Results Of The Paul Bartsch Expedition Of 1930.” Smithsonian Contributions to Zoology (1989): 1-34. Online library. Web. Cory, Charles B. “The Birds of the West Indies, including the Bahama Islands, the Greater and the Lesser Antilles, excepting the Islands of Tobago and Trinidad.” The Auk. American Ornithologists’ Union (1886): 45. Science Direct. Web. Hamel, Paul and Arturo Kirkconnell. “Composition of mixed-species flocks of migrant and resident birds in Cuba.” Cotinga 24 (2005): 28-34. Science Direct.Web. Huntington, J. L. and T. Barbour. “The Birds at Soledad, Cuba, after a hurricane.” The Auk (October): 436-437. BioOne. Web. Lovette, I. J. “A comprehensive multilocus phylogeny for the wood-warblers and a revised classification of the Parulidae (Aves).” Science Direct (2010):753-770. Web. Lovette, I. J. and E. Birmingham. “What is a Wood-Warbler.” The American Ornithologists’ Union (2002): 695-714. The Auk. Web. Sangster, George. “A new genus for the waterthrushes(Parulidae).” The Auk (2007): 212-215. Ebsco Host. Web. Vázquez, Alexis Heminio Plasencia, Yatsunaris Alonso Torrens and Fernando Ramón Hernández Martínez. “Distribución vertical de las aves Dendroica pityophila y Teretistris fernandinae (Passeriformes: Parulidae) en Pinar del Río, Cuba.” Revista de Biología Tropical (2009): 1262. Ebsco Host. Web. Wiley, James W. “Bird egg and nest specimens in the collection of the Instituto De Ecología Y Sistemática, La Habana, Cuba”. Journal or Caribbean Ornithology (2012): 15-23. The Auk. Web.